Objective: The aim is to compare the consequences of flushing the arterial and central venous catheters with normal saline and the use of heparinized saline on its patency by monitoring and blood sampling. Methods: A randomized double blinded trial was used. A total of 272 patients were randomized to receive either heparinized saline flush Group A (n=137, 50.4%) or normal saline flush for Group B (n=135, 49.6%). Patients were randomly allocated in two groups by online randomizer. Data collection occurred over 8-hour intervals for three continuous days on presence of acceptable arterial waveform, arterial backflow and/or central venous backflow. Results: A total of 272 patients were randomly assigned to the two treatment types. No statistical significant difference in the measured blockages of these lines between the patients assigned to the two flush solution groups were found, p=0.651. However there were slightly more occlusions in femorally inserted arterial lines across patients of Group B, with no significant statistical difference. Conclusion: Based on our results, there was no evidence that the use of heparinized saline solutions would have better impact in the maintenance of patency for arterial and central venous than using normal saline. Therefore, the results support the stoppage of using heparinized saline as flush solutions. Key words: Arterial Catheter, Central Venous Catheter, Normal Saline Flush, Patency. For most patients in cardio-surgical Intensive Care Unit (ICU), the making of clinical differential diagnosis and interventions is dependent on the validity of different physiological changes measured or obtained from samples using an arterial or central venous catheter (1). The Central Venous Catheter (CVC) represents the most common parenteral site for medication delivery. When used with ICU patients, arterial catheter or CVC tend to be occluded by blood clot at its distal tip, encouraging frequent reinsertions. Consequently, the maintenance of the catheter patency is important for reducing ICU patients’ stay time as well as reducing the cost associated with such replacement. The process of flushing the lumen of catheters is considered as the most important factor in preventing catheter occlusion. (3) Heparin, by its nature is considered as an anticoagulant that helps to anticipate the occurrence of clotting. Heparin has been hypothesized to extend the functional duration of arterial and CV catheters, by preventing blood clot from forming on the tip of the catheters. (4) On the other hand, heparin has the disadvantage of interacting with other drugs as well as causing serious side effects such as bleeding complication and immune-mediated heparin induced thrombocytopenia (HIT). (5, 6) Four studies (7-10) were performed to assess the patency of heparinized and normal saline solutions for the preservation of arterial line only patency over short period of time. These studies concluded that there were no significant differences between heparinized and normal saline flush solutions for preservation of catheter patency. On the other hand, this study investigated the impact of flushing the arterial and CVC with both normal saline and heparinized saline. Ethics approval was obtained from the ethics committee of Royal Medical Services, consent from patients and their families as protocol in Queen Alia Heart Institution. All postoperative patients (elective or emergency) presenting to the cardio-surgical ICU between August 2017 and the end of December 2017 were eligible for the study. Exclusion criteria were applied to patients whose age was under 16 years, patients from foreign countries, and patients who received platelet or fresh frozen plasma treatment. A randomized double blinded trial was used where only senior nurse staff of the shift knew which patient received normal saline or heparinized saline as flushing solution, this was done to recognize any complications that may occur efficiently. A total of 272 patients were randomized to receive either heparinized saline flush group A (n=137, 50.4%) or normal saline flush group B (n=135, 49.6%). The patients were randomly allocated in two groups by the use online randomizer application. Patients were card labelled either Group A “heparinized saline” or Group B “normal saline”. Arterial line catheters used were of length 11 and 8 cm, 3 F and 4 F gauge, and were inserted in either radial or femoral arteries. CVCs were triple lumen polyurethane central venous catheter 15 and 30 cm, 7 F and 7.5 F gauge, inserted in Internal Jugular or Femoral veins. The flushing solution and giving set were prepared using a 500 ml or 1000ml normal saline bag pressurized to 300 mmhg, and a flow rate of 3ml/hr was maintained through a pressure monitoring kit. Heparinized normal saline prepared by adding a 10,000 units (100 mg) of unfractionated heparin to a 1000ml normal saline (10IU/ml) (11). And these cannulations were performed by cardiothoracic anesthesiologists or cardiothoracic surgeons. During the treatment process, the tubing was kept unobstructed with blood or air bubbles at all time. The transducer was also correctly zeroed at every shift with three shifts per day. Data were gathered over eight hours’ time intervals that started at 8am, 4pm and 12am for three continuous days on presence of acceptable arterial waveform, arterial backflow and/or central venous backflow and documented. Statistical Analysis performed by SPSS for windows (IBM SPSS Statistic), and categorical variables were analyzed by chi-squared test. Two hundred seventy two patients were randomly assigned to the two treatment types. The majority of the patients were males (n=219, 80.5%) and the remainder were females. These patients underwent various Cardio-vascular surgeries, but the majority (80.9%) underwent Coronary Artery Bypass Surgeries, and fewer of them (11.8%) underwent Valve replacements, and another smaller proportion of them (4%) underwent mixed procedures like valve and ACB procedures, the rest (3.3%) underwent other cardio-vascular surgical procedures. Moreover, all of them required a central venous line coupled with an arterial lines to be inserted to them at the day of the surgical procedure, these central venous lines were either inserted into their Right Internal jugular veins (n=227, 83.5%), or via the femoral vein (n= 45, 16.5%), likewise the Arterial cannulas were either inserted via the patients Radial Arteries (n= 238, 87.5%) or via their Femoral artery (n=34, 12.5%). Fortunately, a few central lines of those arterial and central venous lines got occluded (CVC: n= 11, 4%, Arterial Lines : n= 15,5.5%) , notably there were more occluded Arterial lines than CVC, but the total occlusions were equal to 36 occlusions regardless of the line type and location , however , which comprise (9.6%) of all the inserted lines. However, these lines were randomly and blindly treated with either of the two types of flush solutions , clearly most patients (n=137, 50.4%) received treatment A (which is heparinized solution ), and the rest ( n=135, 49.6%) received type-B flush solution (i.e. Saline flush solution), the numbers of patients within each treatment group however were not different, please see (Table-I) . Table I: Patients Demographics and Lines characteristics. N=272. In turn of gender difference and surgical procedures, patients assigned to each of the two groups did not differ significantly. Beside their Central line type location and the associated occlusive events when examined using the chi-squared test of independence, as shown in the (Table-II), denoting that people across the two groups were nearly similar on all measured factors. It is evident too that regardless of the solution used to flush these lines (Arterial and CVC lines), there was no statistically significant difference in the measured blockages of these lines between the patients assigned to the two flush solution groups, however there were slightly more occlusions in femorally inserted arterial lines across those patients who received treatment (B) but the difference was not statistically significant nevertheless. Moreover, the overall occlusion incidences did not differ across the two treatment types regardless of the central line types, p=0.651, indicating that there was no sufficient evidence to suggest that the occlusions may differ between patients receiving either flush solution types . Furthermore, we decided to take a step further to estimate the effect size of these treatments (i.e. flush solutions) as such we determined to assess the joint and individual association of both the location of insertion of both arterial and CVC lines plus treatment types with various solutions with the odds of having an occlusive event for both central lines separately see (Table-II). It is noteworthy that our sample size was relatively large but the witnessed occlusions were small and they approximated the internationally reported incidences as such we concluded that the above two relevant predictors that we have measured will be admitted to the two binary logistic regression analysis models reported in the next section. 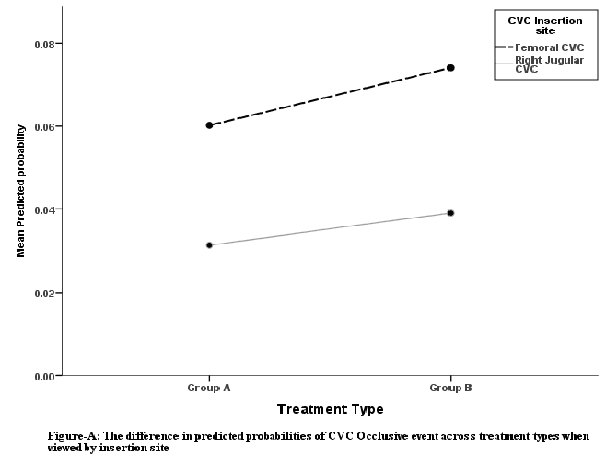 The (Table-III) shows the binary logistic regression analysis for the odds of having an occluded CVC line given the treatment B and the insertion site. Firstly our model was not statistically significant, however the model suggested that by accounting for the CVC location as a predictor, the odds of the patients experiencing an occluded CVC line when treated with the solution-B is 1.25 times more than that for those who received solution-A, however the difference was not statistically significant, p=0.720. Too, the odds of Right internal Jugular vein inserted CVC of getting an occlusive event is 0.51 times ( i.e., it is =1-0.51 x 100= 49% ) less than those lines inserted into the femoral vein when considered jointly with the treatment types, none the less the figure-A was used to plot the predicted probability of an occlusion produced by the logistic regression analysis against the treatment solution types and the colored lines depicted the CVC line insertion site, it is clear that thosefemoral vein CVC’s had slightly higher adjusted predicted probability of becoming occluded in general compared to RIJ inserted lines, but they are ( i.e. femoral vein CVC's ) are also slightly more predicted to become impeded when treated with the Type-B solution than solution type A in general as shown in (Figure-A). Reference Comparison Groups: Treatment=A, CVC location= Femoral Vein. In the same manner, we examined the effect size of the treatment types and the Arterial line insertion sites on the odds of having an occluded Arterial line using the Binary Logistic regression analysis. Again, our model was not statistically significant and our aim was to approximate the odds ratio for the difference between treatment types when the location of arterial line is accounted for as shown in the (Table-IV). The model suggested that arterial lines treated with the flush solution type-B are at an increased odds of becoming blocked compared to treatment solution A when the arterial line is considered jointly despite that there was no statistically significant difference between the two solution types on their measured protective effects against occlusions in arterial lines, p=0.889, the lines treated with solution B were associated with (7.8% )times more odds of becoming occluded. Furthermore, the arterial lines insertion sites differed slightly with their odds of becoming occluded when accounting for the effect of treatment, those lines inserted via the Radial artery were (1-0.367 X 100=63.3%) times less predicted to encounter an occlusive event compared to those inserted via the Femoral artery despite the absence of a statistically significant evidence of a difference between the two insertion sites on their odds of becoming impeded. (Figure-B) depicts the difference between the two treatments on their predicted probabilities (i.e., adjusted propensity) of occlusion when viewed by insertion types, clearly femoral arterial lines are more predicted, in general, to become occluded, but those femoral arterial lines treated with the solution B are even slightly higher than those treated with solution A on average as noted in (Figure-B). For decades, there had been argument about the type of flush solutions to maintain arterial and central lines catheters patency. Some physicians and ICU nurses use heparinized saline and some of them are using only Normal Saline without any clear evidence. However, safety and cost problems appeared, leading practitioners to question this practice. This study was done to determine if there was any difference in maintaining catheter patency when using normal saline or to heparinized saline as flush solutions. In our study, regardless of the solution used to flush these lines (arterial and CVC lines), there was no statistically significant difference in the measured blockages of these lines between the patients assigned to the two flush solution groups, however there were slightly more occlusions in femoral arterial lines across those patients who received normal saline flushing solution but the difference was not statistically significant nevertheless. Moreover, the overall occlusion incidences did not differ across the two treatment types regardless of the central line types, p=0.651, indicating that there was no sufficient evidence to suggest that the occlusions may differ between patients receiving either flush solution types .Our results were close to Tuncali et al,(7) there was no significant differencebetween heparinized and non-heparinized flushsolution for maintenance of artery catheter patency, and they described that it was due to the short duration of cannulations. In their study, the mean duration of cannulations was as short as six to seven hours while in our study; it was as long as 96hours. Del Cotillo et and al Kulkarni et al,(9, 10) performed resemble studies but with longer duration of cannulationsat 96 hours. Bothstudies results were similar to the results of ourstudy whereby there was no significant differencebetween heparinized saline and normal saline in maintaining arterial and central lines catheters patency. Consequently, it could be concluded that it was the continuous flush under pressure that maintained catheter effectiveness rather than use of heparinized saline solution. Most of the time, it was believed that the universal use of small doses of heparin was unexpected to cause any problems. Anyhow, in Ling et al,(6) it was advocated that even small amounts of heparin might result in a heparin-related thrombocytopenia. Moreover, Del Cotillo et al (9) announced that use of heparinized saline as flushing solution changed PTT significantly. To keep away from adverse effects from heparin exposure, the change of flushing solution from heparinized saline to normal saline appeared justified. Even so, there were limitations in this study. As this study took place only in the cardio-surgical ICU and in patients with age over 16 years, results could not be generalized to the population. In this study, the duration of cannulation was not measured in actual hours. For that reason, the mean duration of cannulation in normal saline and heparinized saline groups could not be calculated. Regarding relatively low frequency of arterial and central lines catheters occlusion, conducting large scale studies could assess the difference of heparinized and normal saline solutions flush better. Based on our study, we found that there was no significance difference between the normal saline and heparinized saline solutions used in the maintenance of patency for arterial and central venous catheters. Our results support the stoppage of using heparinized saline as flush solutions. This calls for a change in practice to provide safer patient care. 1.Reich D, Mittnacht A. Monitoring of the Heart and Vascular System. In: Kaplan JA, editor. Kaplan’s Cardiac Anesthesia: The Echo Era 6th edition. St. Louis, Missouri: Elsevier Saunders; 2011. p. 416-451. 2.Morino, PL. the ICU book 4th edition. Philadelphia, PA: Lippnicott Williams & Wilkins, 2014. 3.Kornusky J. Central Venous Catheter Care: Lumen – Flushing and Locking. In: Judeth A, editor. Lippincott's nursing procedures 5th edition. Ambler PA, 2009. 4.Frendl G. Pocket ICU. Philadelphia: Wolters Kluwer, 2017. 5.Cronentwett J L. Rutherford's Vascular Surgery. Philadelphia, PA: Elsevier Saunders; 2010. 6.Ling E, Warkentin TE. Intraoperative heparin flushes and subsequent acute heparin induced thrombocytopenia. Anesthesiology. 1998; 89(6):1567–9. 7.Tuncali BE, Kuvaki B, Tuncali B, and Caper E. A comparison of the efficacy of heparinized and nonheparinised solutions for maintenance of perioperative radial arterial catheter patency and subsequent occlusion. AnesthAnalg. 2005; 100(4):1117–21. 8.Randolph AG, Cook DJ, Gonzales CA, Andrew M. Benefit of heparin in peripheral venous and arterial catheters. Systematic review and meta-analysis of randomised controlled trials. BMJ 1998; 316: 969–975. 9.Del Cotillo M, Grane N, Llavoré M, Quintanas S. Heparinized saline vs saline solution in maintenance of arterial catheters: a double-blind randomized clinical trial. Intensive Car Med. 2008; 34(2):339–43. 10.Kulkarni M, Elsner C, Ouellet D, Zeldin R. heparinized saline versus normal saline in maintaining patency of radial artery catheter. Can J Surg. 1994; 37(1):37–42.